On April 19, six Fairfield University undergraduate seniors were recognized for their leadership and outstanding achievements at the Student Achievement Awards. Fr. von Arx congratulated them in his welcoming remarks, and joined the group for a special dinner with their families and friends after the event. Jacqueline Aquino ’16 received the prestigious St. Ignatius Loyola Medal for “exemplifying the true spirit of a Jesuit education” through her high academic standards and substantial involvement in community service. Among her many accomplishments, Acquino, a double major in mathematics and music, is a Magis Scholar, a member of Alpha Sigma Nu and Pi Mu Epsilon, president of the Math Club, musical director of Sweet Harmony, Service for Justice alumni mentor and Orientation Support Team member. In her remarks at the ceremony, Aquino thanked the University community and her family. “I have learned that there is nothing that can limit passion, and the best life is one lived for others. I have given my heart, my passion, and everything I have to Fairfield, but it doesn't compare to how much Fairfield has given me,” she said. The William J. Kramer ’60 Humanitarian Award went to Claretta Mills ’16 for her “commitment to volunteerism and service to an external community activity that best exemplifies the Ignatian tradition of being men and women for and with others.” As a student at Fairfield, Mills participated in and led volunteer trips in Costa Rica, Ecuador and Jamaica. Mills is also heavily involved in the Racial Justice is Social Justice movement and has been a Cura Personalis Mentor for the past three years. “The world needs kindness and people who are concerned with the welfare of others. Humanitarian work is simple, just maybe even caring about your neighbor, asking about someone’s day, and seeing how you can simply help someone if they need help,” she said. Four seniors received Student Achievement Awards for their commitment and enhancement of University programs: Blanca Aca-Tecuanhuehue ’16 for her commitment to women in science; Erin Connors ’16 for her commitment to Fairfield University Athletics; Daniel Horstmann ’16 for his commitment to Music Ministry and the Praise Project; and Allison Scheetz ’16 for her commitment to welcoming and on-boarding new students. 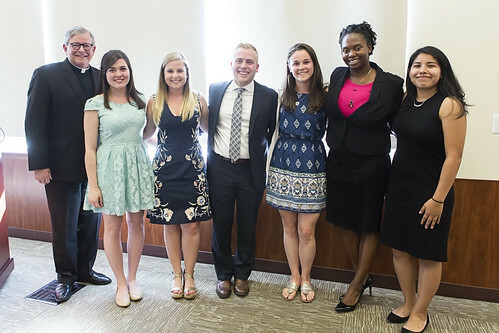 One graduate student from within each academic school who made an impact during their time at Fairfield University was also recognized at the Graduate Student Service Award Ceremony and Dinner in the Dolan School of Business Dining Room on April 16. Marion Peckham Egan School of Nursing and Health Studies: Anka Roberto (Doctor of Nursing Practice; PMHNP Across the Lifespan) focused her doctoral work in psychiatric mental health with a focus in care for traumatized families, children and communities. Additionally, Roberto serves as the director of simulation across undergraduate and graduate programs at Fairfield University. She is a member of Alpha Sigma Nu, is the chair of the Innovation Committee at the School of Nursing at Fairfield, co-chair of NLN Healthcare Simulation of CT Committee, a faculty advisor for the Student Nurses Association and volunteers at the Trauma Recovery Network. College of Arts and Sciences: Alan Manning (MA in Public Administration) “exemplifies the notion of service in both his professional life and in his volunteer work…in his spare time, what would be considered a full-time position advocating for children facing critical medical challenges.” Manning serves as chief operating officer of Planetree, a non-profit organization that personalizes the healthcare experience for patients and their families. He is also the founder and vice president of Kisses from Katie, INC, a non-profit organization in honor of his daughter that provides necessary resources to critically-ill children and their families. School of Engineering: David José(MS in Mechanical Engineering) “can be found teaching undergraduate students on a regular basis and helping them in their lab assignments as part of his graduate assistantship responsibilities…David is the ideal graduate student we expect to see at Fairfield University who not only excels in the classroom but also in the community.” In addition to his academic work, Jose is the vice president of the Indian Graduate Student Association and is an active member of JUHAN. The Regina A. Quick Center for the Arts was packed on Tuesday, April 26 with students at the 8th Annual Leadership Recognition Awards. The event was hosted by Liam Cahill '18 and Jessie Lizotte '18. The ceremony honored and recognized students who have gone above and beyond in service to their peers and to the Fairfield University campus community, and recognized student leaders primarily in elected and selected leadership roles on campus, along with developing student leaders. The award categories included Campus Ministry, Career Planning Center, Student Diversity and Multicultural Affairs, Center for Faith and Public Life, Office of Stduent Engagement, Residence Life, FUSA and Jesuit Student Leadership. At this year's ceremony, The Meghan Doyle Programmer of Year Award was presented to Brianna Tancredi for her passionate dedication & commitment to FUSA programming. This award is presented to a deserving FUSA programmer who goes above and beyond in their responsibilities within FUSA. The Meghan Doyle Programmer of the Year is in honor of 2009 graudate Meghan Doyle who passed away in 2013. While at Fairfield, Meghan was a member of the FUSA programming board as well as the Director of Programming where she worked tirelessly to make every FUSA event the best it could be for the University community. In addition to the above categories, The Rising Stag Award was presented to Alexandra Levy and Paulina Baclawska, The Melissa C. Weiss Award for Leadership Excellence was presented to Matthew Turner, the Magis Award was presented Anmol Tabassum and the Cura Personalis Award was presented to Rachel Carlowicz.